Many of us want more ways to help the environment and don’t often hear about rain barrels. They are a simple way to conserve water and reduce your summer watering bills. They reduce water pollution by reducing the amount of water that goes into storm drains. They reduce your water use since most rain barrels can save you about 1,300 gallons of water during the peak summer months. During a single rain, a 45 gallon rain barrel is easily filled. Reducing the water in storm drains and reducing the amount of water you use are great for the environment. 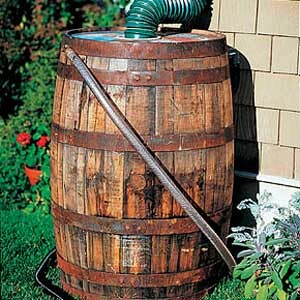 <href=”http://www.thisoldhouse.com/toh/article/0,,1183289,00.html”target=”_blank”>Rain barrelsThe water in your rain barrel is great for watering your lawn or a garden (just wash fruits and vegetables before eating). The water can be used to scrub down a deck or chairs that might have become targets for the local birds. There are many uses for this free water and while you are using it, you can know you are helping the environment. If you plan on drinking the rain water, you need to filter and purify it first. This water came off your roof where birds sit and there are bugs. But it’s easy to make it drinkable: First filter it through a home water filtration pitcher and then boil it (order really doesn’t matter). You can purchase a rain barrel at many home improvement stores, or build your own. The key to using a rain barrel is to build a simple platform about 1 foot high near or under a rain gutter downspout. You might need to modify the downspout to flow into the rain barrel. The platform helps the water flow from the spigot for watering. 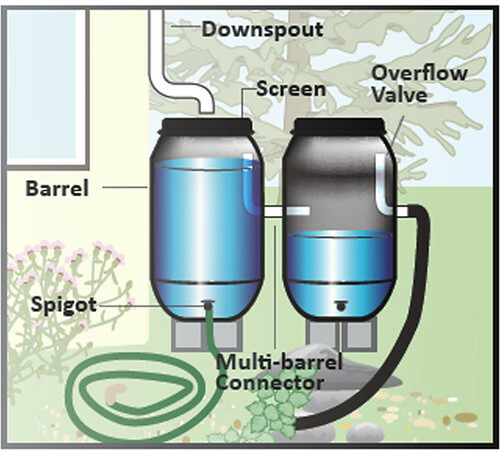 <href=”http://waterla.org/workshops/rain-barrels-rain-chains-and-cisterns”>Rain Barrel BasicsOnce you have your rain barrel in place, be sure the screen is secure, and you might even add one of those mosquito rings if you are worried about mosquitoes. This really isn’t necessary since the screen keeps water bugs and mosquitoes out of the rain barrel. Rain barrels are that easy to install and use. They help the environment, and they help your water bill. Check them out and join us in helping the environment.